In order to learn what expects you in Munich, read about its attractions, dining and shopping options and places of interest, here on eventegg. Can it get any greater than visiting a city whose motto is ‘Munich loves you!’? The capital of the Bavarian state, the third largest city in Germany is all there to welcome you with its generous offerings, rich cultural heritage, and of course, a lot of beer! Home to almost 1.4 million people in 8 districts, Munich has been one of the most visited cultural hubs in Germany. For sure, the famous Oktober Fest, the beer festival has a major role in this climbing number of visitors. The cultural heritage that still can be seen clearly in every part of the city also contributes to the visitor number that increases every year. There are many things in Munich that you will admire and be happy of seeing. The architecture style of Munich is probably going to be one of the firsts to be noticed. Not only the iconic buildings as Frauenkirche and Neues Rathaus but also a bunch of other places will fascinate you with their aesthetics. As well as all having a large number of museums, palaces, beautiful restaurants and parks and being a center for all sorts of activities, technology and science’s heart also beats in Munich in Germany. The highly prestigious universities in the field keep contributing to the academic fame of the city as well. It also serves as one of the top choices to hold international congresses and fairs. Munich is near the Bavarian Alps, on the south of Germany. International Munich Airport is located 30km north east of Munich city center. The official website of the airport lists the possible transportation to and from the airport. The other airport in the city, Allgäu Airport Memmingen, usually hosts domestic flights or the ones from nearby countries. You can check here to find about the transportation options. The best way to enjoy Munich is of course going around on foot. If you feel tired or not like walking, then you can use the local transportation in Munich, which is also known as one of the most convenient ones all across Europe. MVV Munchen gives all the needed information about the bus, metro, tram and trains with an extended map and a journey planner. It is really hard to keep track of time in this one of a kind Bavarian city as there are so much to see and participate in. That’d be good to plan your free days in advance to make the best out of your time in Munich. Munich has got literally a large number of places to see; castles, buildings, parks, churches and landmarks. If you have plenty of time to spend in the city you might as well see all of them however if you are here for just a couple of days you might want to visit the most predominant ones. Here is a top 10 of sightseeing in Munich. One thing to remember about Munich. It is one of the most expensive cities in all Germany. So you may consider preparing your wallet accordingly, as you will come across a bunch of things you will want to take home with you. The most popular areas for shopping are Maximilianstraße, Kaufingerstraße, Hohenzollernstraße, Leopoldstraße and Gärtnerplatzviertel. You will find a lot of well-known stores as well as elite little boutiques and stores. If what you are looking for is a bit more traditional shopping, then you may head to Viktualienmarkt and Elisabethmarkt. These are the two famous flea markets in the city. You have the chance to eat the classical Bavarian food in Munich as it is filled up with restaurants which still serve the traditional dishes from the cuisine. Don’t miss out the Weisswurst breakfast, that’s the most Bavarian your meal can get. In downtown Munich, you will probably come across to a large number of Italian restaurants. Due to the immigration from Italy during 60’s, the Italian restaurants are also as good as they are in Italy. The beer gardens are also a must, as you are in the home of them. You will find a bunch of them, you may even find guided tours to the breweries. Keep in mind, if you like beer, then you will enjoy the Biergärten, if you don’t, just a quick stop by would be enough. The night life is also live in Munich, thanks to the university student population. Haidhausen, Maxvorstadt and Schwabing are three famous night life areas in the city. If your trip falls within autumn, especially the end of September and beginning of October, than you should definitely catch the Oktober Fest and drink as much as beer just like a Bavarian. Nearby German cities or small towns are also good options to get away from the city. Salzburg in Austria is close to Munich and there are several trains each day. Sports excursions, such as skiing and hiking in the Bavarian Alps are also among your choices. 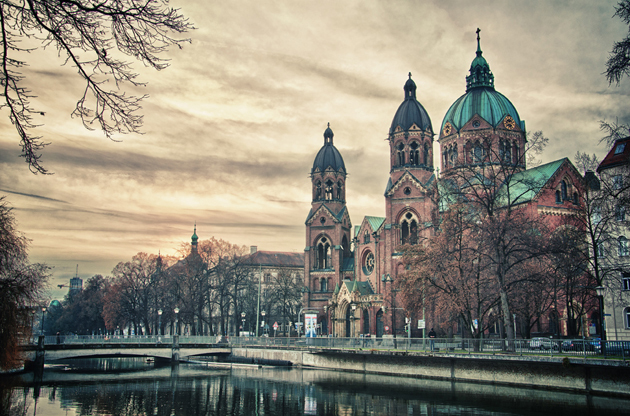 The capital of Bavaria, apple of Germany’s eye, Munich is one of the top chosen cities to host large scale events. A large number of event tourists visit the city to be a part of congresses, conferences, symposiums, fairs, tradeshows and exhibitions every year. The success of the organizers and the world standard capacity of the venues make the Munich a great center for international meetings when the exquisite beauty of the city is also taken into account.